He was a designer specialising in ‘bentwood’ furniture, manufactured from veneers of natural woods, normally beech, which were softened by steam. His chair designs contrasted with the hand crafted chairs of the day. His No 14 Chair was the first chair to be mass produced in thousands, on a production line. Thonet saw that there was a opportunity to use his innovative industrial production technology, to mass manufacture new designs. The production line was staffed by semi and unskilled workers. There was no longer a need to have skilled craftsmen at every stage of production. The No 14 chair was manufactured as separate parts and simply screwed together (six ‘steam bent’ wood parts, ten screws and two nuts). This construction technique was a precursor to the way furniture is constructed in our modern world, as flat packs. This meant that thirty six completed but disassembled chairs, could be packaged safely, in a one cubic metre ‘sea crate’, for transport around the world. The No14 Chair was composed of solid beech, not veneers. Thonet had perfected steaming solid wood and bending it to form unusual shapes. The Arts and Crafts Movement of the 19th Century believed in the manufacture of hand crafted products, made by craftsmen, often as single items / one offs. Thonet believed in the mass manufacture of quality furniture, on a production line, using semi and unskilled workers. 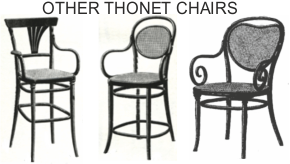 The Thonet Company manufactured for a world market and fifty million No 14 Chairs were sold before 1930.